Much like your taste in music or your choice of car, your style is an extension of yourself. Titanium Jewelry�s selection of modern men�s jewelry includes a cache of artfully designed men�s rings, bracelets, cufflinks, dog tags, money clips, key rings and more, all of which are aimed squarely at upping your personal style. Whether you�re a rule-breaking renegade with an eye for tough tungsten rings or a sharp and sophisticated trend-setter hip to titanium cable bracelets, Titanium Jewelry has got the cool men�s jewelry that will feel tailor-made to you. Our family-run business has been delighting folks just like you, since 1988. You get the �white glove treatment�, distinctively cool men�s jewelry and free shipping. Browse one of the web�s best selections of unique and trend setting men�s rings, including men�s wedding bands and statement rings. Made of contemporary materials such as tungsten, palladium, Damascus steel, cobalt and more, these stylish men�s rings aren�t phased by active lifestyles. As soon as that first ray of light illuminates your new favorite piece of jewelry, you�ll know you made the right decision by shopping with us. Maybe you like the darker side. Then shop for a black titanium ring. Or get inspiration from light-years away with a far-out men�s meteorite ring. It doesn�t matter if you want timeless or trendy, you�ll find got a ring that suits your specific style. These premium men�s wedding rings and more are backed by a lifetime warranty. Who does that anymore? Getting married? Then you need some groomsmen�s gifts on your wedding day. Titanium Jewelry�s titanium money clips and key rings make thoughtful gifts for your best men. You get free shipping on orders over $99, plus easy 90-day returns if you�re not completely delighted with your purchase. We back all of our jewelry with a lifetime warranty to ensure that your most precious pieces are with you for life. 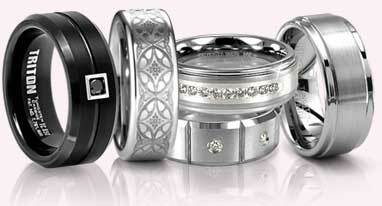 Buying jewelry online is simple and safe at Titanium Jewelry, your family-run jeweler since 1988.